Introducing Gentilhomme Jean-Gilles, Communications Trainee | HURAH! Tom Luce in front seat of a “tap-tap” heading down Delmas Ave. the day before he headed back home via Florida (Mar. 7). 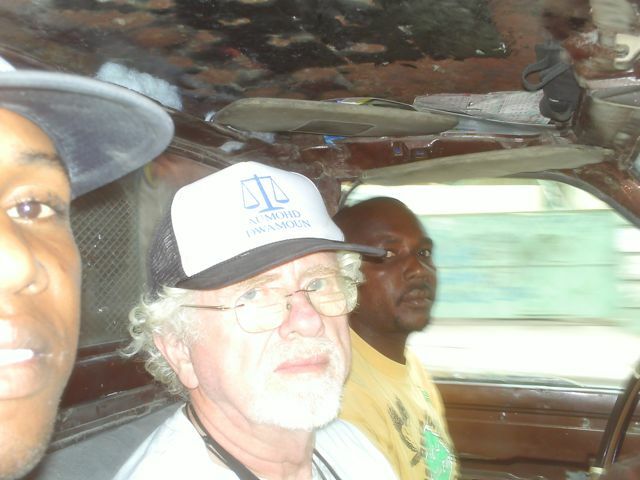 In the cab with him is Gentilhomme Jean-Gilles who has worked with HURAH since 2007. HURAH has offered him a scholarship of computers and a motorbike to become a Trainee In Communication. With his reporting HURAH will be able to keep in touch with what is going on among our human rights defender friends and their future plans. Gentilhomme lost his home and a family member in the quake and one of his legs was injured. Before the quake, he had been enrolled in a technology school, which was destroyed. HURAH and Gentilhomme will help each other in the months to come. Please consider this “Trainee” program when you think you might like to support HURAH’s efforts financially. By helping him with gasoline for a motorbike and phone bills he will be able to do more keeping HURAH up to date with work on the ground in Haiti. Your HURAH donations have already provided Gentilhomme with a laptop and other communications gear. We also have asked him to work with the Haiti Response Coalition, the coalition of small grassroots Haitian relief agencies trying to fill the inevitable gaps in international relief efforts.